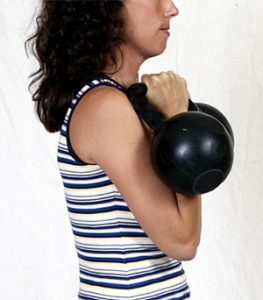 A kettlebell is a cast iron ball with a handle on it. They have been used in Russia for centuries by their Olympic athletes and Military. Today kettlebells are used by all types of people with a variety of goals. For example, athletes, powerlifters, martial artists, law enforcement, military, dancers and regular men and women who just want to be in the best shape of their lives. 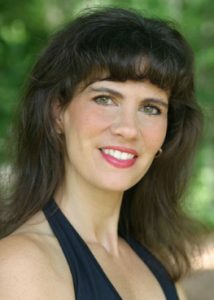 What can Kettlebells do for me? 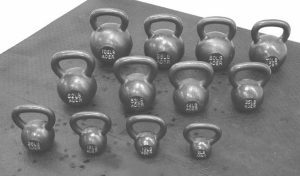 What makes Kettlebell training different from other types of weight training, such as dumbell training? The design makes the kettlebell different. When you hold a kettlebell, the weight is displaced differently. There is a constant pulling on you due to the center of mass being different. With dumbbells the weight is evenly distributed over your hand. When you hold a kettlebell, the weight is not distributed evenly and therefore you have to counter balance. The handle on the kettlebell makes the weight easier to hold for the ballistic drills and also adds a pulling, due to momentum and gravity (red arrows below), during these drills that you have to actively counter with tension in the muscles of your body (orange arrows below). This makes the drill harder, more effective, and more taxing on the muscles of your body, creating a very efficient and effective workout. The kettlebell exercises not only target the major muscle groups but also targets the hard to work stabilizing muscles as well. It is a total body workout in much less time. Kettlebells, unlike dumbbells and machines, allow for more range of motion during the lifts to improve flexibility. The exercises are compound movements. They mimic everyday motion, treating your body as a whole, not a group of parts like isolation exercises. When performed with proper form they are safe for just about everybody. Attention to detail is the key. I highly recommend finding a kettlebell instructor in your area to teach you the finer points of the drills and to correct your form as you go. A session or two with a certified instructor will get you on the right path for safely lifting with kettlebells. Where can I purchase a kettlebell? Kettlebell, Inc. All Rights Reserved.